^ Hochman, Steve (1995-03-28). 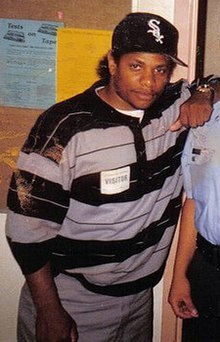 "Rap Star, Record Company Founder Eazy-E Dies of AIDS Music: Singer, entrepreneur helped popularize 'gangsta' style with the group N.W.A. and later became a top-selling solo artist". Los Angeles Times. ^ Harris, Carter (June–July 1995). “Eazy Living”. Vibe 3 (5): 62.